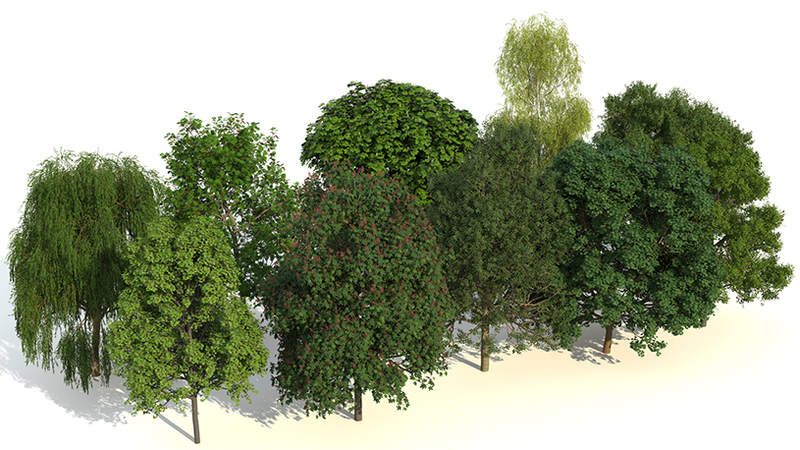 Temperate Deciduous Trees – 10 broadleaf tree species of Laubwerk Plants in 3 variants, 3 ages and 4 seasons each, for architects and CG artists working in 3ds Max, Maya, Cinema 4D, SketchUp, and Houdini. A diverse selection of street trees (e.g. 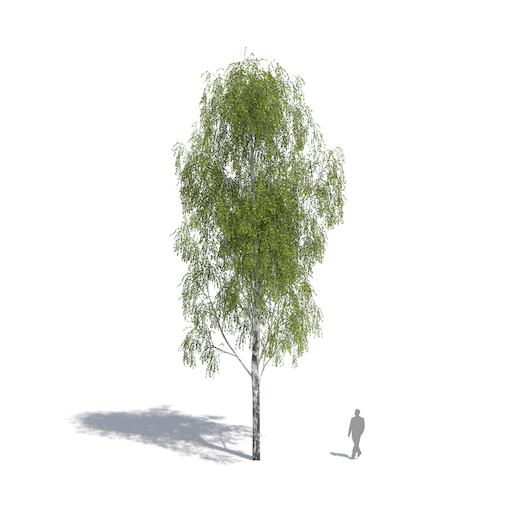 Norway maple, silver linden), as well as the impressively large English oak, the fashionable silver birch and the lovely weeping willow, great for water promenades and margins. 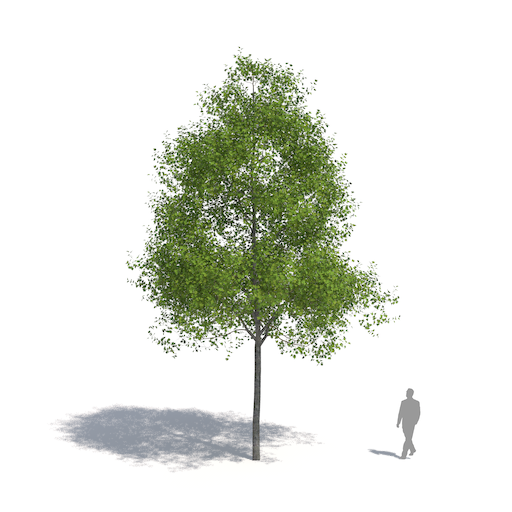 Rendering with Laubwerk Plants Kit 2 trees - English oak (Quercus robur) (by Jan Walter Schliep using CINEMA 4D and VRAYforC4D). 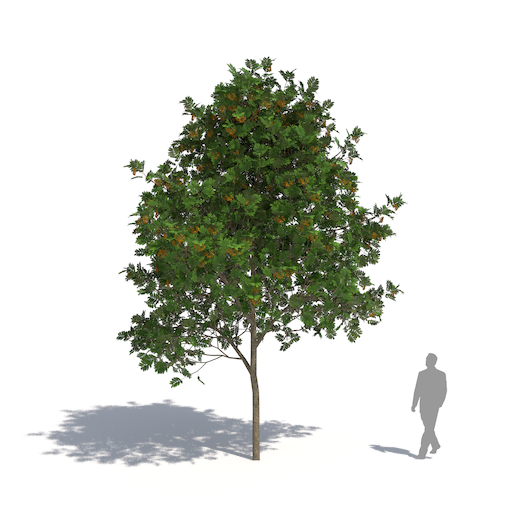 The following 10 tree species are included in the Plants Kit 2. Each species comes in 36 variations per species, i.e. 3 variants, 3 ages and 4 seasonal aspects, for a total of 360 models per Kit. 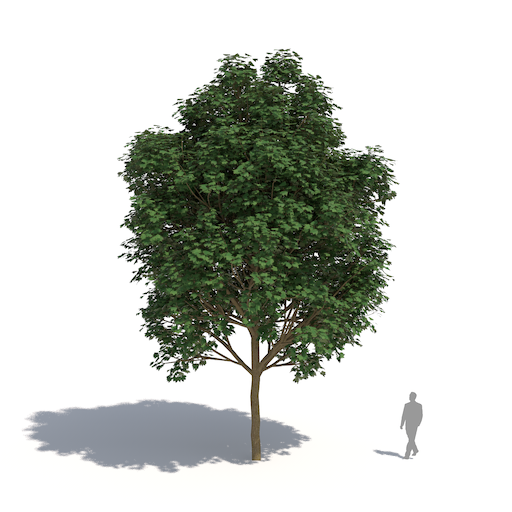 Medium-size to occasionally large tree distinguished by larger leaves with pointed triangular (as opposed to blunt) lobes and the presence of one or more teeth on all of the lobes. The tree tends to leaf out earlier than most maples and holds its leaves somewhat longer in autumn. A popular street tree in North America following Dutch elm disease. A large tree with a broad and round crown. The leaves have five lobes with toothed edges. They are dark green in color with a whitish underside that is often marked with black spots or patches. A popular city tree do to it's tolerance of urban pollution. Tall tree with a domed crown of stout branches and leaves that are opposite and palmately compound. This species turns a strong yellow or brownish yellow in autumn. The leaf scars left on twigs after the leaves have fallen have a distinctive horseshoe shape, complete with seven "nails." 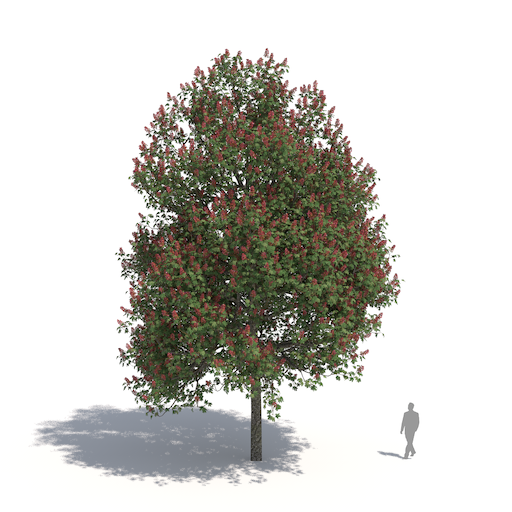 Medium-size tree with a round crown of dense foliage and bright red flowers. Palmate leaves are a dark and shiny green that turn yellow or green in autumn. 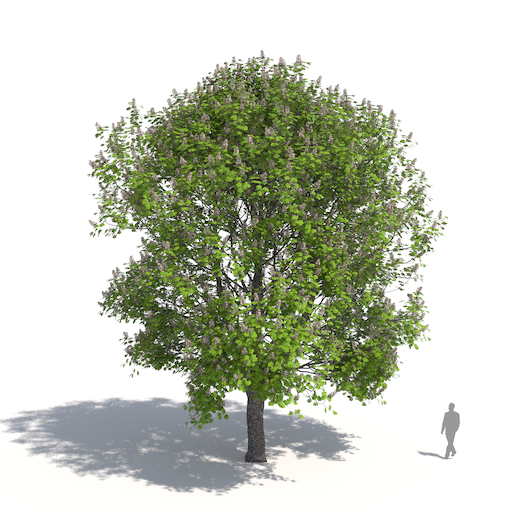 The tree is an artificial hybrid with an unknown origin, but it probably first appeared in Germany before 1820. It is a popular tree in parks and streets. Medium-sized deciduous tree with a crown of arched branches and drooping branchlets. Light green triangular leaves with somewhat fragrant shoots change to medium-green before becoming bright yellow in October. Visually valued for its white bark with black diamond-shaped patches. 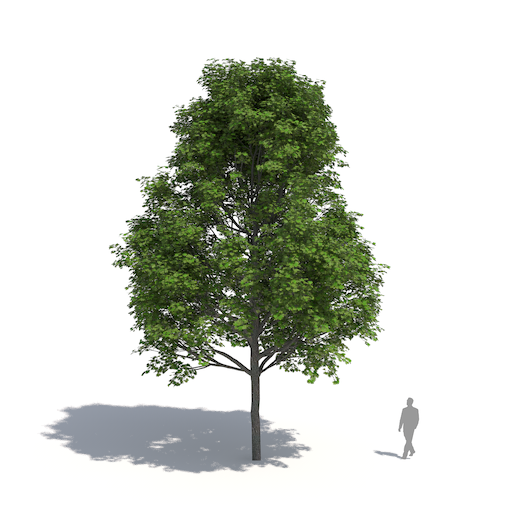 Medium-size tree that starts in a slender conical shape with leader before developing an ovoid crown. This slow to medium/fast-growing species has leaves similar to maple leaves, but alternate. Has a distinctive foliage of fresh green to medium-green with an intense autumn palette the includes fiery violet-brown and crimson-red to orange and yellow in many hues. 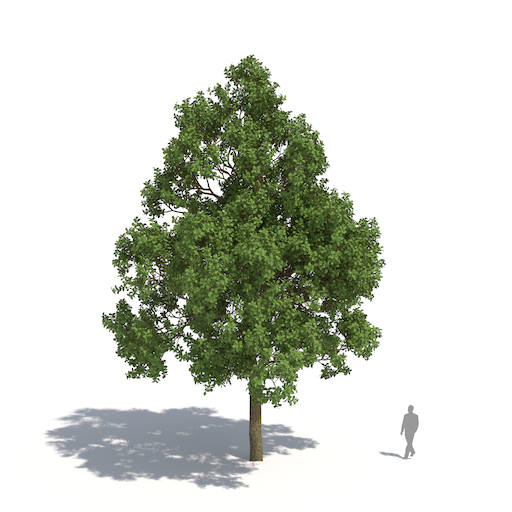 A large deciduous tree with the circumference of a grand oak. 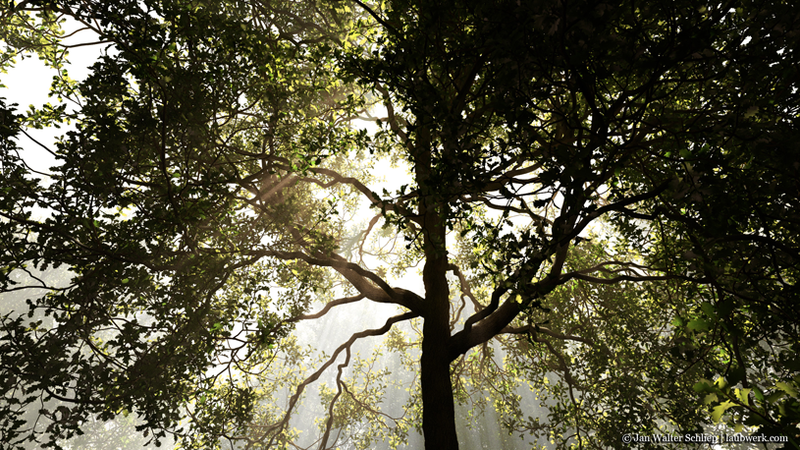 The tree has a wide-spreading crown of rugged branches. The leaves are obovate to elliptical, late shoots, with medium green color and golden green or yellow-brown autumn colors. Retains foliage partially through winter. Impressive, medium-size, fast-growing decorative tree. The crown is curved irregularly wide and the long thin branches hang limply down. The bark is light gray-brown. 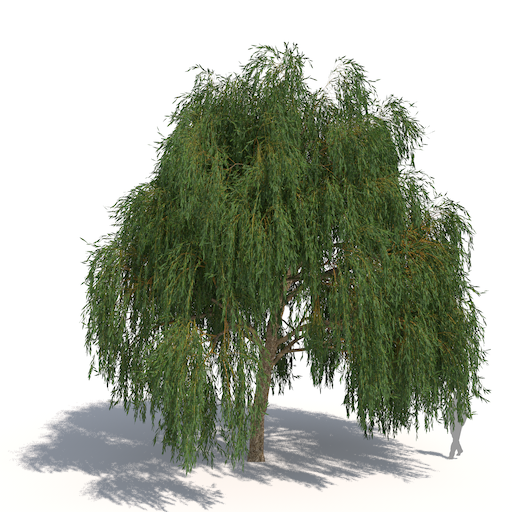 The "weeping" branches are bright yellow in spring and light yellow in summer, holding large leaves. Small to medium-sized deciduous tree with smooth silvery grey bark in young trees that becomes scaly pale grey-brown and occasionally fissured on old trees. The shoots are green and variably hairy at first, becoming grey-brown and hairless. The buds are a conspicuous purple-brown and often densely hairy. The leaves are pinnate, with a coarsely serrated margin, variable hairiness and a dull medium-green color, with bluish hues underneath.The autumn colors are strong-yellow-orange or brick-red. An impressive, large tree. The crown starts broadly conical or ovoid before becoming round. The main branches are stiffly upright, hardly overhanging, with diagonally rising or horizontal twigs. The leaves are broadly cordate and asymmetrical. Shoots are whitish grey, then dull green on top, with white tomentose underneath. The leaves remain green well into autumn before becoming pale yellow in November. 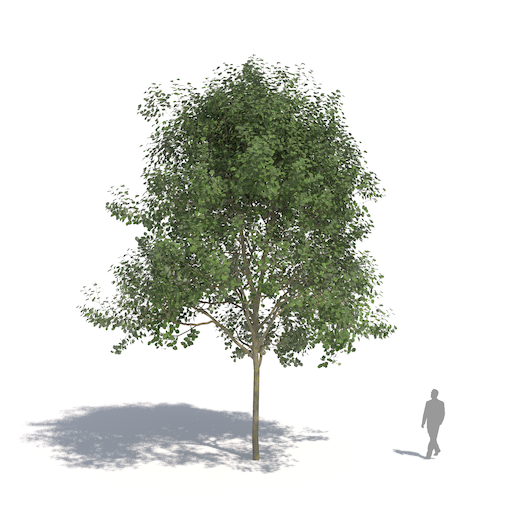 Spring: 10 out of 360 temperate deciduous tree models of Laubwerk Plants Kit 2. 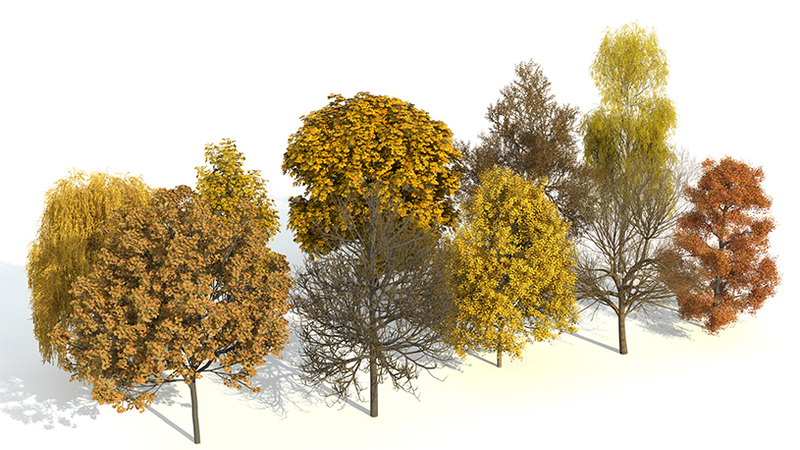 Autumn: 10 out of 360 temperate deciduous tree models of Laubwerk Plants Kit 2. 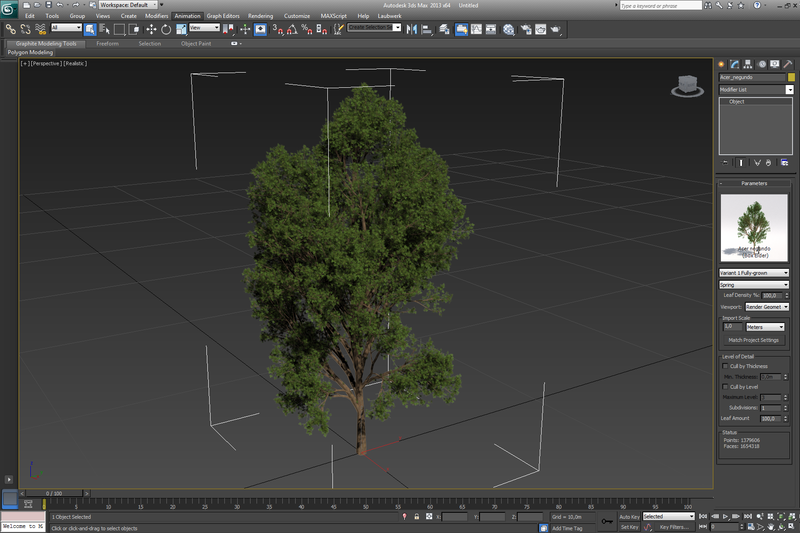 The Laubwerk Player is a plugin for Autodesk 3ds Max & Maya, MAXON Cinema 4D, Trimble SketchUp, and SideFX Houdini, that comes bundled with every Laubwerk Plants Kit. It loads the models and allows for easy selection and manipulation of the models, e.g. choose between variations, ages and seasons and allows fine grained control about Level of Detail. See the Laubwerk Player page for a more detailed description. Attractive pricing per Kit, e.g. single user 149€ (w/o VAT), two users 249€, etc. Laubwerk Customer Support includes technical support by email and free periodic updates for bug fixes and improvements of the Laubwerk Plant models. 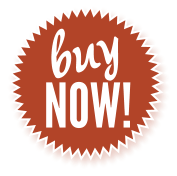 Your purchases are delivered as direct downloads. Laubwerk products are constantly being updated with the latest technology. Keep your Plants Kit up-to-date! To update your Laubwerk Plants Kit 2, log in to your Account Page and download the latest update. 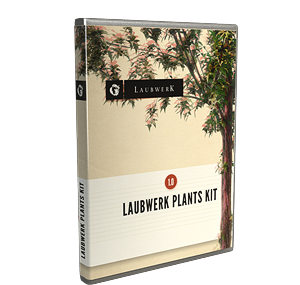 For a free product trial get the Laubwerk Plants Kit Freebie. Autodesk 3ds Max (2010-2019), Autodesk Maya (2015-2018, Win & Mac, Linux on request), MAXON Cinema 4D (R15-20, Mac & Win), Trimble SketchUp (2014-2019, Mac & Win) with V-Ray for SketchUp or Thea Render for SketchUp, or Sidefx Houdini (currently Apprentice 14-15.5 Win, Linux on request). Additionally, Python (on Windows) for customers to build their own importers into applications compatible with Python 2.6, 2.7, 3.3, or 3.4. A computer that is capable of running your version(s) of 3ds Max, Maya, Cinema 4D, SketchUp, or Houdini. 10MB of hard disk space and additional space for the Laubwerk Plants models. Our aim is to make the installation process as easy as possible for you. If you like to get more information, we have compiled these Laubwerk Plants Kits installation instructions, including advanced topics such as considerations when working in a network. Laubwerk is a registered trademark in Germany and/or other countries. All products or brand names mentioned are trademarks or registered trademarks of their respective holders. Copyright © 2011 Laubwerk GmbH. All rights reserved.